Eric Schlosser, co-producer, and Michael Pollan, both ground the film with their journalistic approach. The soundtrack, with its ominous rumbling beneath mass production and the folksy guitar accompanying underdogs, manages to reveal the film’s underlying stance, but FOOD, INC. strives admirably to present multiple views. Of course, that’s a challenge when corporations refuse to take part in the conversation. (Monsanto, Tyson and many others declined to appear in the film.) 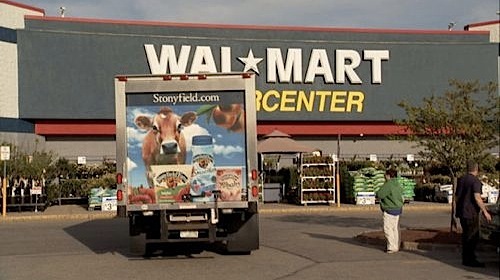 The film offers a surprisingly evenhanded treatment of Walmart executives accompanied by Gary Hirshberg, CEO of Stonyfield Farm. 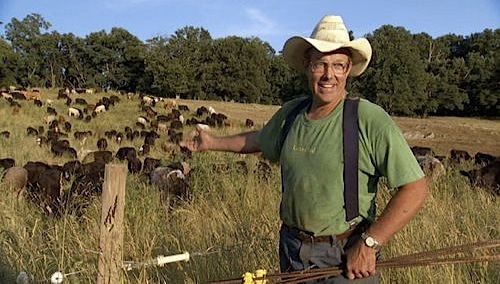 Even more, rock stars of the sustainable food world, such as self-proclaimed grass farmer, Joel Salatin, inadvertently reveal the gray areas of their own much praised business models. After all, how sustainable are loyal customers who drive 400 miles to buy happy, healthy meat? As someone who has visited feeding lots and blood-slicked slaughterhouses, once worked a very long day in a chicken processing facility, and still wrestles with her decision to continue eating meat, I attended the screening expecting another sermon for the converted. When one of the press contacts reminded me to use all caps whenever I referred to the title of film, I concentrated very hard not to roll my eyes. Yet I there I sat later, stunned by what I was learning. But there’s also the woman willing to lose her contract with Tyson in order to shed light on an oppressive industry, the farmers banding together, and the scores of other individuals in the film who are working to make a difference in ways both huge and small. It’d be an overstatement to say FOOD, INC. is optimistic, but it does end with some modest suggestions for what each viewer can do to help move us toward a safe, sustainable system. More importantly, its wider release will, like the Obamas’ garden, help push the topic to center stage for the public and policymakers alike. Anyone who needs a good, clear primer on the food industry and the state of agriculture in the U.S should see this documentary. If you’re already well versed or long converted, it’s an important film to see and discuss with others — your mom who is addicted to the big box stores, your friends who aren’t convinced that local or organic is worth the extra effort, or your children who have a full life of choices ahead. For as the film reminds us repeatedly, we cast our vote every time we eat. My first corporate job out of college was for an agri-chemical company, and I was assigned as a study assistant for a field residue team. The study directors on this team would take, say, a new herbicide and conduct studies in x areas of the country, as required by the FDA, and determine the parts per million/billion of residue left on a given commodity after y period of time (that’s the short answer). One day I asked my supervisor how she felt about organic food (I mean, c’mon,I went to an Arlo Guthrie concert with her, so she’s got to have a thought on this). Her reply stuck with me: when you have to feed billions of people every day, you have to roll the dice. If organic food could sustain the planet, then great. The waltz between public demand for organic food and the reality of feeding our world each day is not an easy one. Generally, the U.S. has the best food supply in the world, yet agri-business has put a strangle-hold on how it produces food, warts and all. Yeah, I’ve read “Omnivore’s Dilemma” (I’ve cut down on meat after reading that). On another angle, I’ve read that if China, with their burgeoning middle class, ends up eating meat like Americans, we’ll need 2.3 earths to sustain that. Having read that, I’ve been thinking that how we spend our $$ or what we put into our mouths has a much bigger impact than what lever we pulled in any election. We vote every time we find ourselves at the drive-through window or checking out at Whole Foods. I noticed that you discussed the film Food Inc. on your blog and I wanted to let you know about a film called Our Daily Bread which I think you would find fascinating. Itâ€™s similar to Food Inc. in how it illuminates the horrific reality of industrial agriculture, however; Our Daily Bread is not an advocacy film in the traditional sense. The film communicates its messages using provocative images of places where food is produced by going deep inside the world of high-tech agriculture. Our Daily Bread touches on animal husbandry, labor issues, and the shocking reality of food production with a very distinctive style. The film is available on home video and can be purchased on our website: http://homevideo.icarusfilms.com/ Clips and reseller information can also be found here: http://homevideo.icarusfilms.com/new2006/odb.shtml I appreciate you taking the time to read this. We are an independent company with limited resources, so if our film interests you, I would appreciate it if you could mention it in an upcoming post. If you have any questions about Our Daily Bread or Icarus Films, please donâ€™t hesitate to contact me.